Living Area 2,750+ Sq. ft. This contemporary home is sited in complete harmony with the surrounding landscape. It boasts interior floor plans that provide outdoor views which bring nature right into the living spaces. Nestled on a wooded 4.1 acres lot, this house features numerous energy saving features: a southern exposure, deep over hanging roof, interior air circulation and recently installed efficient furnace and hot water heater. 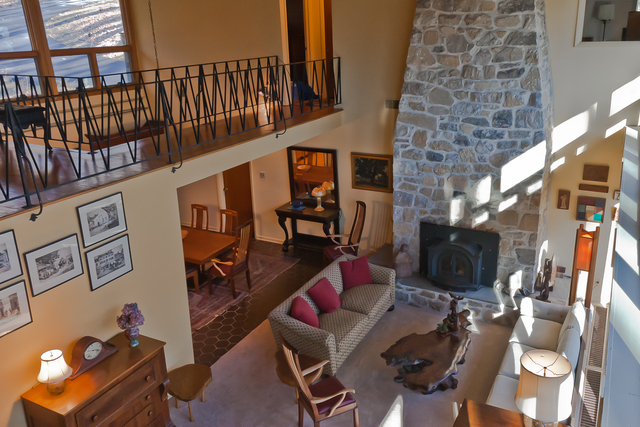 There is a fabulous wrap around flagstone terrace off the combined Living Room/Family Room/Breakfast Room. Every room is light-filled. There are soaring ceilings, fabulous walls of glass windows and sliders to the outside, beautiful wood floors, a two- story Pennsylvania Fieldstone fireplace, recently installed septic system, wonderful privacy and much, much, more. This location is convenient to schools, shopping, T/E public schools, public transportation, and major highways. Of special note are the open staircase leading from the upper entry level down to the lower living level and the craftsman built and designed tiger maple and walnut kitchen cabinets. This home is for a lover of the truly unique.